Fanesca Apartment – a touchpoint for the adventures! 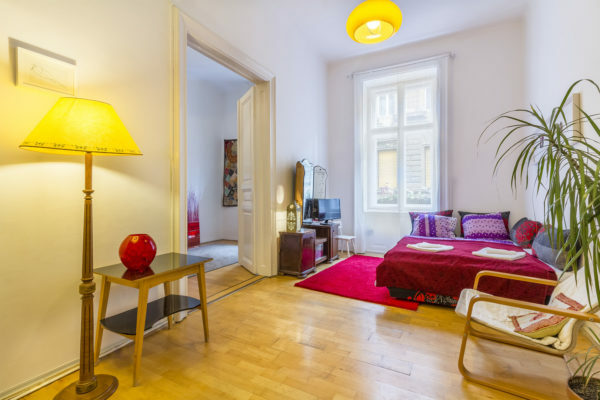 This elegant apartment in the middle of downtown, next to the main avenue is a touchpoint to discover both Pest and Buda. In the spacious flat with 2 bedrooms and a living room, 6 people can rest comfortably and you can cook in the well-equipped kitchen. Fanesca apartment with its style has a real atmosphere of Budapest downtown. With its two bedrooms and a big living room, it is perfect for families and bunch of friends. Discover the city from the core point of Budapest! The Liszt Ferenc Academy of Music, the St. Stephen’s Basilica and the Opera House are just some corners away from the flat. Beside this cultural hit, the apartment is situated in the nightlife area with the coolest bars, trendy restaurants, in the center of the famous ruin-pub culture. Go and explore!